16ft Half Cabin boat max 6 persons, 6hp motor, anchor and includes all fuel and fishing licence exemption. 18ft Half Cabin boat max 8 persons, 8hp motor, anchor and includes all fuel and fishing licence exemption. 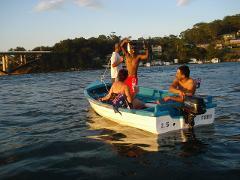 14ft Aluminium boat max 6 persons, 8hp motor, anchor and includes all fuel and fishing licence exemption. 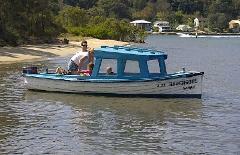 16ft Open boat max 8 persons, 6hp motor, anchor and includes all fuel and fishing licence exemption. BBQ Boat, boat max 12 persons, 30hp motor, BBQ, toilet, anchor and includes all fuel and fishing licence exemption.